Origin Traders, founded in 2005, has literal roots deep within the coffee industry. The family of Origin Traders owner, Rajeev Ganapathy, has farmed coffee in India for generations and owns plantations in the Coorg district, growing Robusta and Arabica beans. 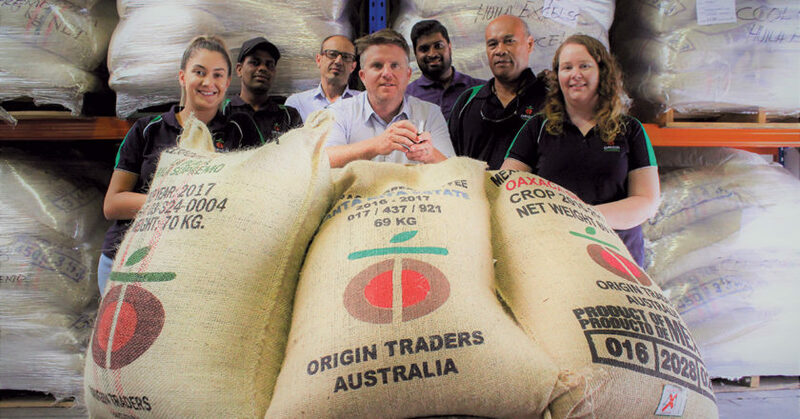 Luigi Anselmi, Origin Traders National Sales Manager, says Rajeev first moved to Australia as an engineer but decided to return to the family traditions by setting up Origin Traders as a green bean distribution company. In addition to the beans grown on his plantations, Origin Traders also supplies many varieties from 18 origins, where Luigi says it has developed strong relationships with growers. Those robust relationships are key to the company’s success, he says, and it is equally important to nurture them with both suppliers and clients. “It’s important to be able to source quality product and that the supply is reliable,” Luigi says. “You don’t want to be in a situation where you can’t guarantee supply. That is why Luigi says the company’s staff members, whom he describes as having a passion for all things coffee, often go back to the source. Supporting its customers is as significant to Origin Traders as making a sale, Luigi says, as that continued support results in long-lasting relationships with roasters also. Origin Traders takes great pride in its quality control and sampling methods. Luigi says this applies prior to shipping and again on arrival of beans in Australia to ensure consistency. Cuppings are held almost daily at its Sydney headquarters. The company has warehouses in New South Wales, Victoria, Western Australia and New Zealand, allowing it to respond to customer requests as required, delivering orders the same day whenever possible. Environmental and sustainability issues are important to Origin Traders, as is economic development in the areas its coffees are produced, Luigi says. The company strives to have a positive impact on the communities in which it sources its beans. He gives, as an example, the village of Kekasa in the Eastern Highlands of Papua New Guinea where Origin Traders buys coffee and has deepened its community involvement by helping to construct the local Hagarowsh Elementary School. “We went there, the school was in need of some TLC and it became apparent that we could help them and do something for the community,” Luigi says, obviously proud that the company’s relationships go beyond those that are commercially viable. Ben Presland, Origin Traders’ Business Development Manager for New South Wales and Queensland, says the company also tries to help roasters gain a better understanding of their product from origin and thus, a better customer service level. “Rather than just trying to push a particular bean, we’re helping roasters to develop a better offering within their market and their position,” he says. Ben says Rajeev’s plantation experience aids the company’s understanding and ability to engage with other suppliers, and customers can also visit the Indian plantations. Some of those clients will be buying huge quantities of beans while others are buying only single bags, Ben says, but all are equally important. Once companies grow large enough to employ a dedicated coffee buyer, they will often go to the growers themselves to source product, Ben says, but Origin Traders can adapt to their needs to maintain the relationships.